IS IN REALITY AN ACRONYMOUS? The word LASER stands for "Light Amplication by the Stimulated Emission of Radiation". In simple words, light particles (photons) excited by the current release energy in the form of light. This light is directed in a bundle. In this way the laser beam is formed. Lasers are among the most important inventions of humanity and play a fundamental role in our daily lives; they are used in almost every area that we can imagine including electronics, modern medicine, defense and more. 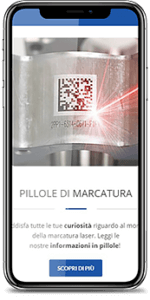 In the industry, lasers are used every day for: engraving, marking, welding, cutting, drilling, cleaning, measuring, detection and more. 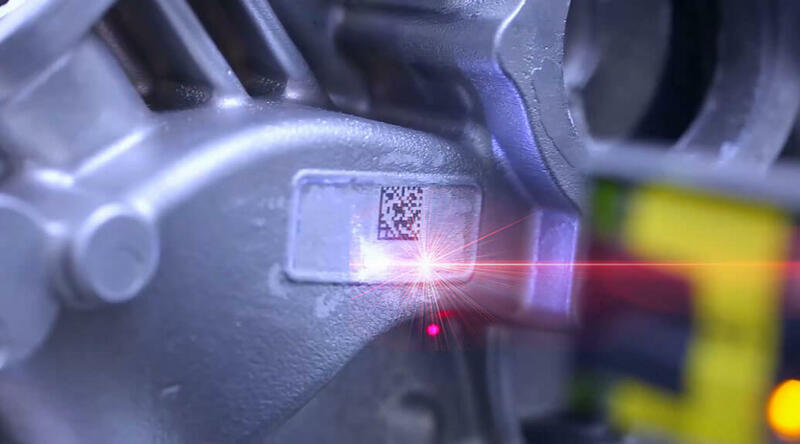 Laser has become one of our most powerful production tools! The pump source directs the external energy to the laser. The active laser medium is positioned inside the laser. According to the design, the laser medium can be composed of a gas mix (CO2 laser), a crystal body (YAG laser) or fibreglass (fibre laser). When transferred to the laser medium through the pump, energy is emitted as radiation. 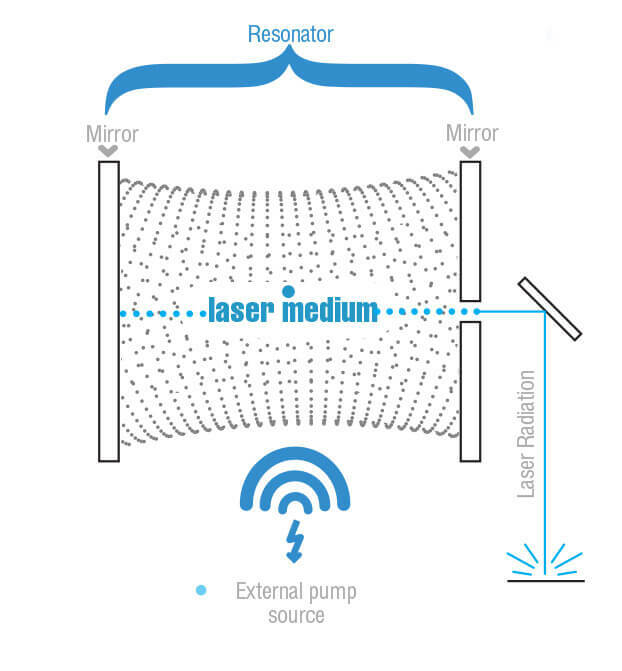 The active laser medium is positioned between two mirrors, the “resonator”. One of these mirrors is one-directional. Radiation of the active laser medium is amplified by the resonator. At the same time, only certain radiation can leave the resonator through the one-directional mirror. This directed radiation is laser radiation. Directionality is the property of maintaining light direction while it travels through space. High directionality indicates the direction is maintained with high precision and low expansion. 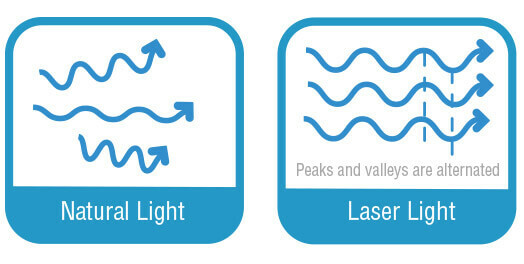 Natural light is a set of light strips propagating in all directions, while laser light is highly directional, making it easy to design optical systems that prevent the light from expanding based on the distance. Coherency describes in what measure light interferes with itself. Considering light as a wave, you could say the more uniform the light beam, the greater its coherency. 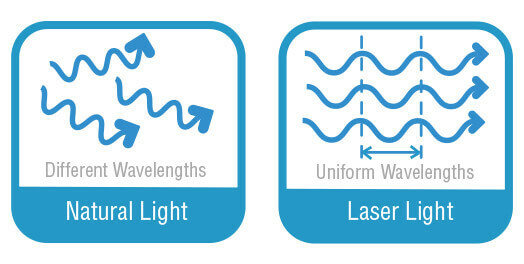 Given the phase, wavelength and direction of laser light do not change, a strong wave can be maintained to transmit laser beams over a long distance without diffusion. This means it is possible to concentrate light in a small area with a lens. 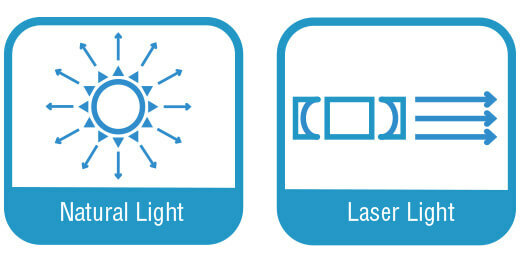 Given laser has excellent monochromaticity, directionality and coherency, they can be concentrated in an extremely small area, thereby creating light with high energy density. Concentrating laser light in an extremely small area, you can increase its intensity (power density) even to obtain sufficient energy to cut metal. 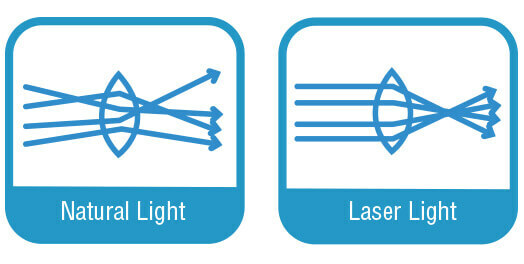 In virtue of these properties, laser light is used in many areas of modern machining of materials. Intensity is maintained for a long time thanks to coherency and can be directed even further with the help of lenses. The laser beam engraves the surface of the material, is absorbed and heats the material. This heat generation causes the material to be removed or completely evaporated. This enables, engraving, marking or cutting of a vast range of materials.